Happy Kitchen Sink Stamps Monday! I hope you had a great weekend! It's been chilly here, seems like we've skipped over Fall and are headed straight to winter! I hope you've enjoyed my sneak peeks for Kitchen Sink Stamps October Release - today I'm sharing with you the full cards, but before I do, I wanted to give you the details on this months release. International orders -Free Shipping on orders $60 and over on stamps ONLY. NOTE: Shipping & Handling will be charged at the time of checkout and qualifying orders will have the S&H charge refunded upon shipment. Orders with a Pre-Ordered item that qualifies for FREE Shipping: the order will be held and shipped when the Pre-Ordered item is available to ship. As I was typing this post late Sunday Night, we had the first snowflakes of the year coming down - brrrr! I experimented with some color combinations for both the leaves and the tree, before I get to those, I wanted to tell you that there are additional leaves on the Multi Step Big Leaves plate and another tree on the Multi Step Tree, so be sure to take a look! For the leaves on my card, I stamped as follows: #1 Memento Pear, #2 Memento Bamboo, #2 Memento Cottage Ivy, #4 Memento Cocoa. (Note I did 3 sets of Green Leaves) Clean stamps. Again I stamped 3 sets as follows #1 Memento Dandelion, #2 Memento Cantaloupe, #3 Memento Desert Sand, #4 Memento Cocoa. Clean Stamps. This time I stamped 5 sets of leaves (you won't see one because it's under the focal image). Stamp as follows: #1 Memento Cantaloupe, #2 Memento Tangelo, #3 Memento Rhubarb, #4 Memento Cocoa. Sponge edges and any White space with Stampin' Up! Soft Suede Ink. Don't you just love how realistic the leaves and the tree are! For the Multi Step Tree, I stamped as follows on White card stock: #1 Memento Tangelo, #2 Memento Rhubarb (stamp off), #3 Memento Rhubarb, #3 Stampin' Up! Chocolate Chip. The sentiment is from the Multi Step Harvest plate stamped in Memento Cottage Ivy. I sponged the edges with Stampin' Up! Soft Suede, then added the Torn Frames panel in Chocolate Chip card stock. To see more detail in my cards, you can click to enlarge. I hope you'll forgive me, as I didn't write down my ink details when I stamped this card. I did some masking with Eclipse Tape in order to have the Basket of Mums from the new Multi Step Harvest in front of the Hay and the Multi Step Pumpkins in front of and behind the hay. I thought the 3 Step Autumn Squirrel went quite well with these sets, so I added him in too! Doesn't this make for a great Fall or Thanksgiving card! Thanks so much for stopping by today, I hope you enjoyed the cards I created using images from Kitchen Sink Stamps October Release. If you're looking for the other tree card I posted a peek for over the weekend, be sure to check back - as I'll be sharing that this week too! For more inspiration featuring this months release, check out the other Kitchen Sink Stamps DT members blogs: Angela, Dee, Connie, Julie, Lori, Lynn , Makiko, Maria (KSS Owner). Don't forget you have until October 23rd, to play along with this months Kitchen Sink Challenge - grab your KSS Stamps and play along - you could win FREE goodies! Such warm and vibrant colors you chose for this card. I absolutely LOVE the distressing around the main image and of course the squirrel perched upon your hay bale in your second card. Gorgeous! What awesome work with those stunning autumn leaves, Lisa!! Total perfection!! They make a beautiful background for your gorgeous tree!! 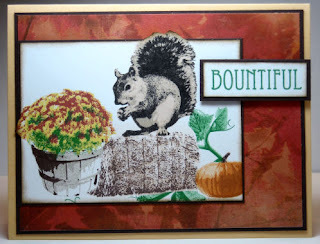 Sensational masking to create that delightful squirrel card!! Such a fun design! These are just beautiful cards, love the colors, FAB!! These are both wonderful, Lisa!! Love the colors on your tree, and how you added the squirrel to the harvest card...too cute! Both cards are so gorgeous, Lisa. What great ways to use the all sets! Fabulous autumn cards!! 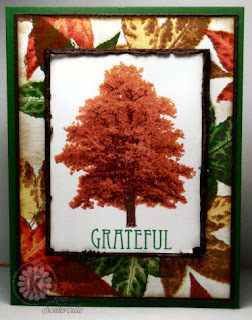 Beautiful fall cards, Lisa! I really like how you combined the tree and leaf sets--they work perfectly together. And the fall scene you created with the harvest set and the others is so creative! WOW! Love these new images! They are so realistic! Love your cards! Wow! great colors:) I can't wait to get my leaf set it looks awesome! I found your site by accident and boy am I happy I did! I'm fairly new to stamping,so, this is my first time to hear about this stamp company. The multi step tree is amazing, it looks so real! I just returned from a trip to Vermont, your tree is a wonderful reminder of the colors and trees I saw there. Your card is gorgeous, I can't wait to get the tree stamp and attempt to make it look as good as yours.